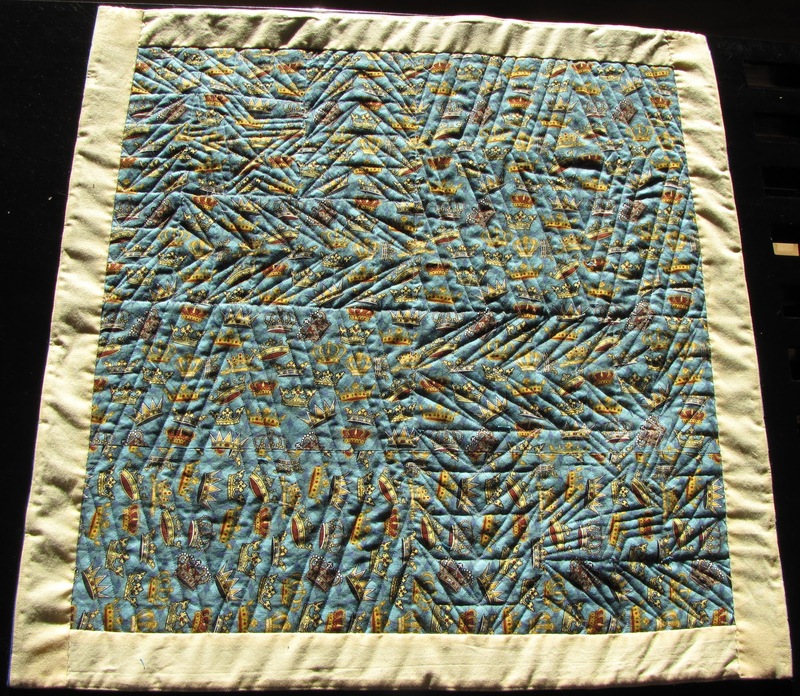 It's been awhile since I've posted - I have been busy with quilting and a few other things. As I have done from time to time, I am posting this "catch up" so fasten your seat belts. And I have a small announcement to make - it's at the end so keep reading/scrolling down. 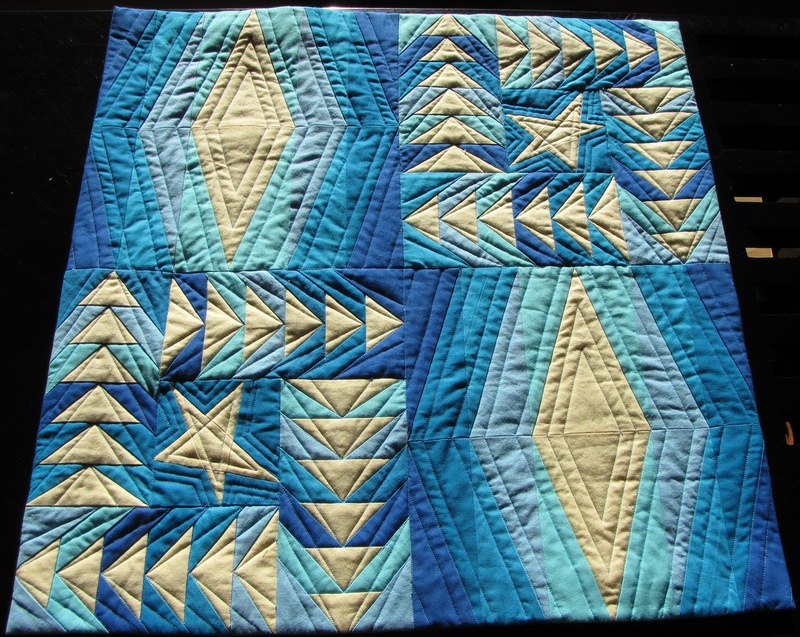 First up: a few customer quilts. Ronnie wanted this quilt to be quilted in a "manly" way. This is Donna's Monopoly quilt. Note the top hat and locomotive quilted into the centre panel. She asked me to put "Doug" in jail because I guess Doug is getting the quilt and he is, as she explained, "not the person you want to play Monopoly with". I quilted these appliqued snowmen for Liz. We were both happy with the way they turned out. Stars in the corners and through the border sashing - swirls (of snow is my thinking) on the rest of the border. Barb has brought me a number of quilts for quilting but she tells me this T-shirt quilt is the first one she will keep for herself. I can tell that it holds some really wonderful memories for her. She's added in a few printed-on-fabric photos of her family, which makes it even more special. In addition to a few "how to quilt" classes that I've taught lately, I recently taught a class on making a little spiral table topper. I made the purple/black with the wizard in the centre as the sample for the store to display, then my class demo was the teal/cream. 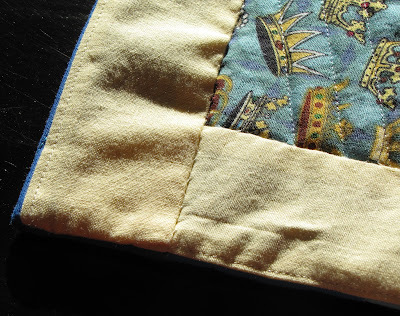 (I did all the quilting on my domestic machine - used some "fancy" satin stitches. I did this because most people taking these classes won't have a long-arm in their basements like I do!) Here they both are. The Lemoyne Star was made using the Lemoyne Star Studio 180 tool. Makes it super simple and fast! A lady in the class said she loved the wizard. I'm not sure if she was expecting to learn how to make the wizard, too - it took the full class time just to get the first row of the spiral done. 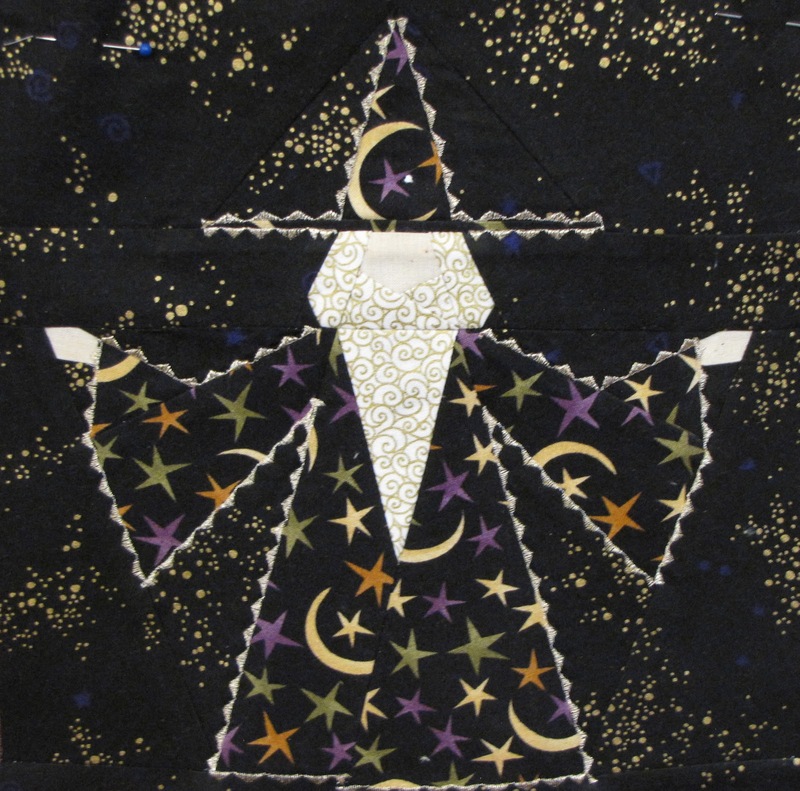 I explained that the wizard was just a bit of jazz I added but that we should ask Janet, the store owner (Addies in Cochrane) if she would be interested in me doing a paper piecing class. She is, so I will be teaching paper piecing on Jan 10 at Addies. 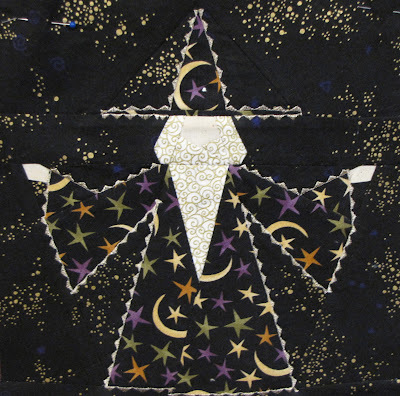 As the wizard is in a book I own, has copyright restrictions and is out of print now, to avoid any copyright issues I developed a pattern to use for the class. It contains three separate blocks combined to make this little mini quilt. The blocks range from really easy, to slightly more difficult. 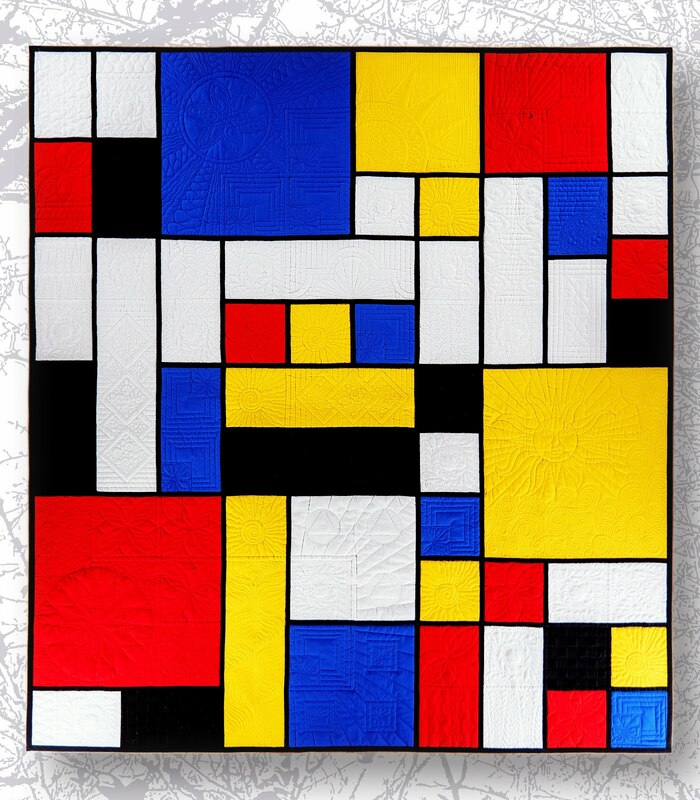 I think if a person can make all three, they should be able to tackle just about any paper piecing project. 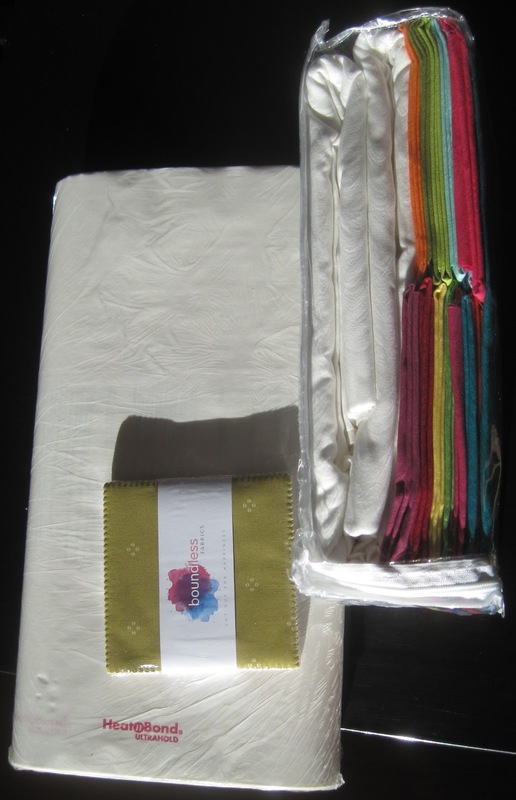 1) "Press the facing strips outwards, then stitch through the facing and seam allowance about 1/8” from the seam." this is an old garment making trick - it really helps to keep the binding flat once it's folded over. 2) make sure the corners are really secured so that the raw edge doesn't poke out at the ends. Update: A FB friend also suggested this tutorial for the faced binding. I haven't tried it yet, but the thing I like about it is the way she does her corners. 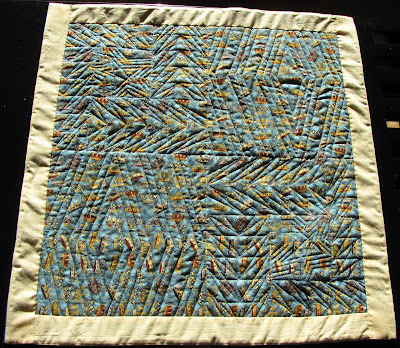 When I do my next one, I'll do the corners from the Silly BooDilly tutorial and the 1/8" stitching from the Terry Aske tutorial. 'Tis the Season.... for E-Shopping!!!! Craftsy had a sale, I couldn't resist 17 yd of solids for 1/2 price (with shipping it worked out to under CD$5.00/yd). Irresistible - so I ordered and the package arrived about an hour ago! Also, I've been using my Brother Scan'n'Cut quite a bit lately - because I can!!!! I ran out of fusible backing so ordered a bolt - it also arrived today! This is the Vikings quilt top. All the Vikings were cut with my Scan'n'cut - fabric first fused to the fusible backing. It's one of many of my own quilt tops waiting to be quilted. I really love quilting and I love my customers and I love that they trust me to quilt their quilts and I love that for the most part they all seem really happy with my work. But I had an avalanche of quilts come in this year and I was working way more on quilting customer quilts than I ever intended. About a month or so ago I realized I'd hit the wall with customer quilts. I want it to stay fresh and fun - not a job, which is what it was beginning to feel like. So I decided to finish off the customer quilts that I have committed to quilt and then take a "hiatus" from quilting customer quilts. I'm not sure for how long, but at least until spring. If you are one of my customers - I thank you very much for placing your trust in me. 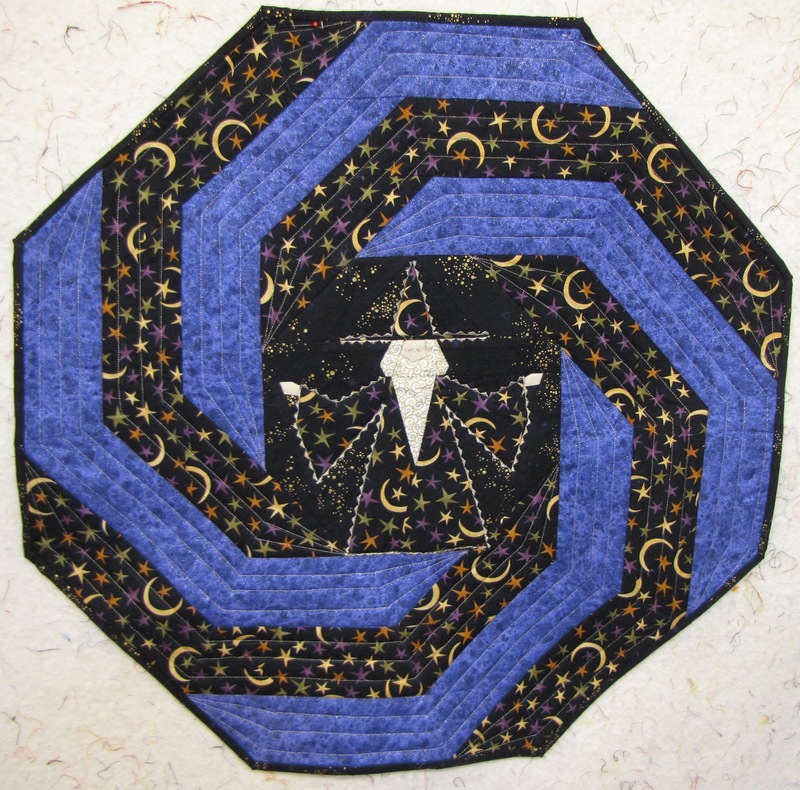 If you (or anyone) need something quilted between now and the time I return to quilting customer quilts, I will be happy to refer you to another quilter. 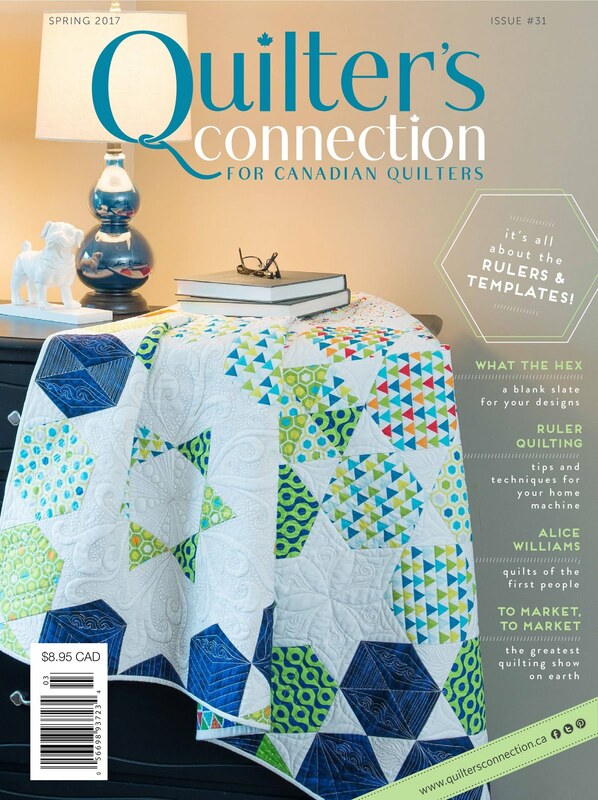 We are lucky to have many talented quilters in the Calgary area. What will I be doing? I have a Tupperware bin full of quilt tops I have made that are waiting to be quilted. 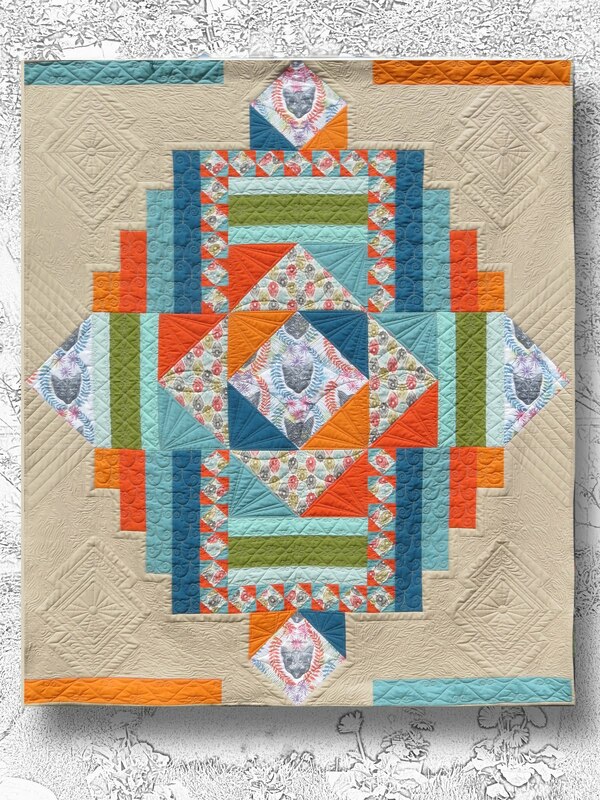 I have a head full of quilt ideas that I want to play with and I also hope to develop a few patterns. No end of things to do! I just need time to do them! Once again - thank you to all my customers. Please stay in touch. I will post when I'm ready to return to quilting for others. And of course, my blog and FB page will continue as ever! 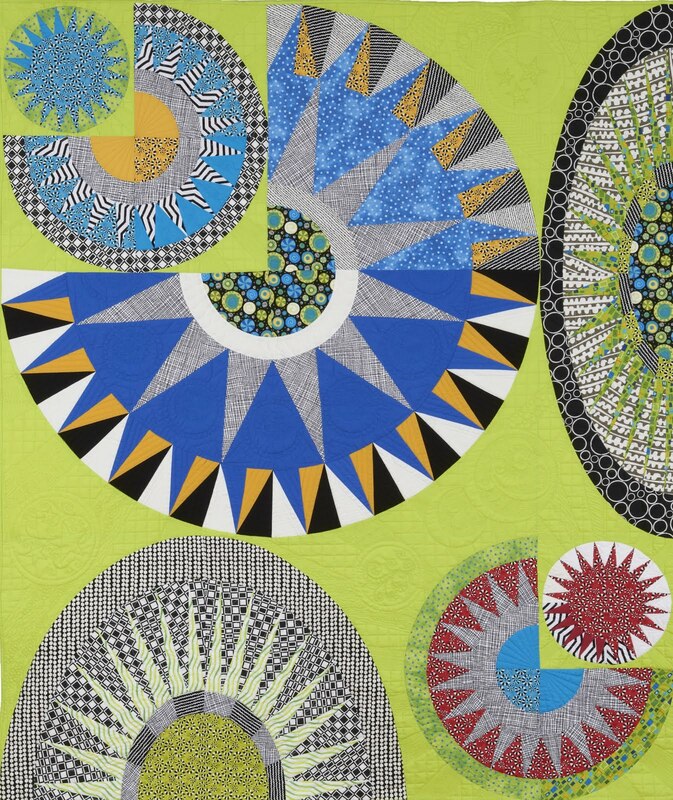 One of the reasons I do this blog is to share with other quilters - I learn so much from the things that other people are generous enough to share - it's my way of contributing to that body of knowledge and experience (good and bad! ).